ULC Robotics, Inc. has successfully flight tested its newly developed vertical take-off and landing (VTOL) fixed-wing unmanned aerial vehicle. As a robotics, energy services and research and development company focused on the energy and utility industries, ULC Robotics’ commercial-grade VTOL fixed-wing UAV has been specifically developed to meet the inspection needs of electric and gas utilities. The UAV was designed and built from the ground up by ULC’s Aerial Services and engineering teams. The platform has a 10-foot wingspan and a sensor payload capacity of 10 pounds for conducting fully-autonomous aerial inspections and assessments of a variety of utility structures and properties, including electrical transmission lines, gas transmission pipelines, and right of ways. In order to collect specialized data for the divisions’ utility customers, ULC will be integrating a variety of sensor and monitoring payloads into the VTOL platform. The UAV will continue to be flight tested with radiometric thermal cameras and high-resolution DSLR imaging systems and, with the 10-pound payload capacity, more than one system can be included on the aircraft at a time. The company also plans to integrate LiDAR, gas leak detection sensors and other advanced systems onto the payload of the drone. The VTOL UAV has a set of eight quadcopter rotors for VTOL, then after reaching a predetermined altitude and airspeed, the aircraft transitions into highly-efficient, forward flight combining the practical functionalities of multi-rotorUAV and the speed and range of a fixed-wing aircraft. The drone is currently running an electric propulsion system with a one to one-and-a-half hour flight time. In the near future, ULC Aerial Services intends to integrate an electric/gas hybrid propulsion system that will allow for a five-hour endurance and 50 mph cruise speed (250-mile range), laying the groundwork for beyond visual line of sight (BVLOS) flight. Planning for BVLOS flights with the VTOL UAV and ULC’s other unmanned aircraft is a strategic aspect of the aerial services program that will allow our utility customers to adopt the most efficient and cost-effective UAV services. “The combination of extended flight time, speed, and range offers enhanced inspections and assessments that improve upon the capabilities of current utility inspection techniques,” said Mike Passaretti, ULC Aerial Services Program Manager. Present electric utility infrastructure inspection methods can be cumbersome requiring utilities to fly helicopters over the inspection site several times a year, which is costly and compromises the safety of the workers due to low airspeed and altitude. 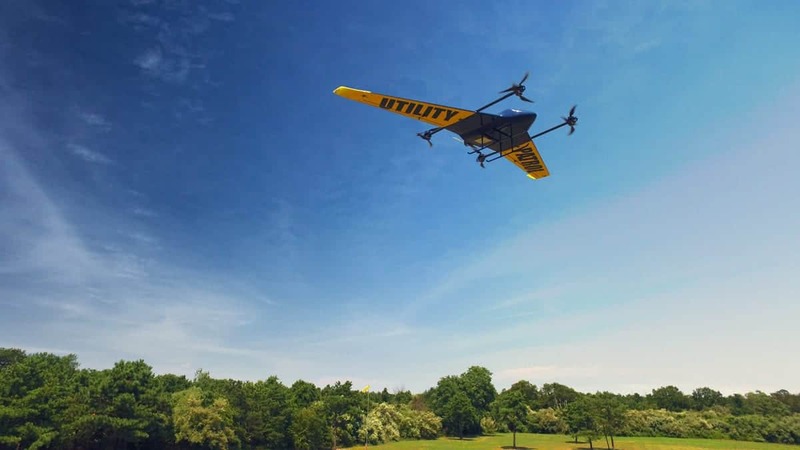 By implementing the use of the VTOL UAV, the data gathered will allow utility inspectors to assess infrastructure health from the safety of their desk, rather than in the air. The UAV’s sensor payload, along with its ability to offset the use of helicopters brings a new level of innovation to utilities that improves asset reliability, reduces the environmental footprint and increases safety. And because the UAV can take off and land from almost anywhere without a runway, it can be dispatched from difficult-to-access terrain, heavily forested areas and densely populated neighborhoods where long stretches of utility infrastructure, such as gas transmission right-of-ways, are time-consuming or unsafe to inspect on foot or with a manned aircraft.